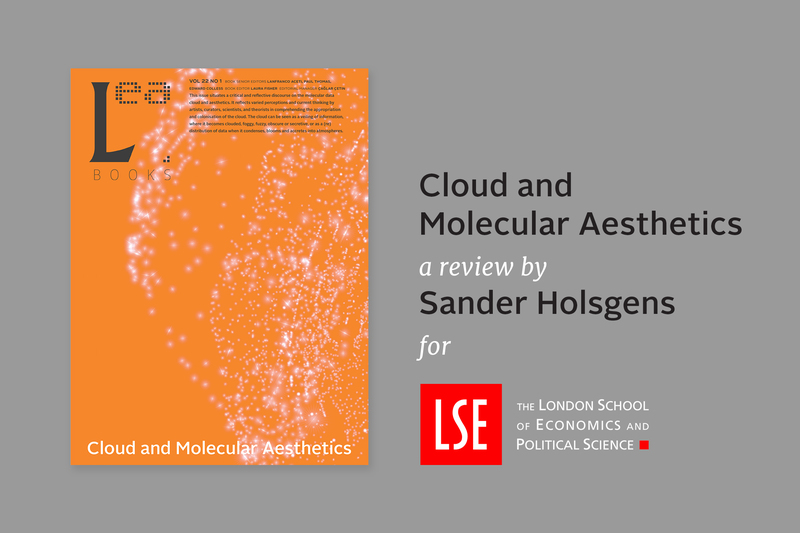 Cloud and Molecular Aesthetics, senior editors Professor Lanfranco Aceti, Professor Paul Thomas, and Professor Edward Colless, has received a great review by Sander Hölsgens for the London School of Economics Review of Books. Hölsgens, who is currently based at The Bartlett School of Architecture, UCL, writes that “the volume orients the arts and sciences towards each other rather than suggesting a contradistinction between them, whilst its proposed molecular aesthetics open up a space to rethink the measureless cloud by focusing on its atomic and infinitesimal dimensions”. He furthermore praises our mode of disseminating the volume: “the contributions are pointed, experimental and tender, and I appreciate the manner of publication: in the cloud, freely accessible, diligently edited and carefully structured”. LEA team was delighted to see that all the hard work that went into the realization of this volume was appreciated, valued, and positively reviewed. Hölsgens’ review gave a poignant and attentive summary of the book and its scope, with a critical analysis and evaluations which clearly reflected the authors’ and editors’ intent. LEA is currently expanding as it enters into ARTECA—the art archive of MIT Press—and prepares to launch a new publishing platform that will shorten times for submission and publishing. We are currently continuing to develop and explore new frameworks for publishing and sharing content online, together with MIT Press and the MediaLab, as an open access outlet for scholarship and research in order to shorten publication times and offer a new review process that is able to respond to the scholarly needs of authors and reviewers in the twenty-first century.